President Recep Tayyip Erdoğan on Sunday called Israel "a terror state" that targets innocent civilians in a response to its Prime Minister Benjamin Netanyahu's remarks against the Turkish military operation in Afrin. "I do not need to tell the world how cruel the Israeli army is. We can see what this terror state is doing by looking at the situation in Gaza and Jerusalem." Erdoğan said Netanyahu cannot find proper international support for his actions and reminded the Turkey-sponsored U.N. resolution rejecting the U.S.'s recognition of Jerusalem as Israel's capital by a vote of 128-9. "Israel has carried out a massacre in Gaza and Netanyahu is a terrorist," Erdoğan said. On Sunday, Netanyahu criticized Erdoğan after the Turkish president condemned the Israeli army's killing of 16 Palestinians who participated in peaceful protests near the Gaza-Israel border. 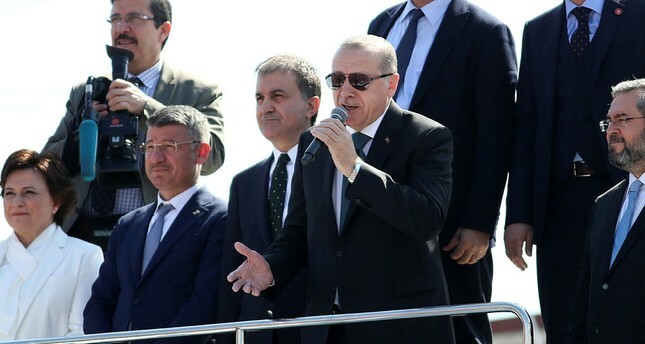 "We will continue to expose Israeli terror all the time and on all platforms," Erdoğan told supporters in Istanbul, describing Friday's events as an "inhumane attack." Calling the Israel forces "the most moral army in the world," Netanyahu accused Turkish military of bombing civilians. "The most moral army in the world will not be preached to by those who for years indiscriminately bombed civilian populations," Netanyahu said on Twitter. International human rights groups criticized Israel's use of live ammunition on the protesters, while U.N. Secretary-General Antonio Guterres has called for an inquiry into the deaths.